A vocal warm up is the #1 thing you can do to improve your singing every day. Unfortunately, too few singers or professional speakers actually bother to do one! But the very best singers warm up every day. Exclusive Bonus: Download our FREE Video with all 10 Singing Techniques and scales for each exercise! Most people don’t do vocal warm ups because they’re afraid of looking silly. I know that seems backwards. You’d think that in a competitive industry like singing, you’d do everything you can to get an edge. But sometimes, when I ask people to do a vocal warm ups, they go cold. And I think that’s because people are afraid to try something that doesn’t sound like beautiful singing. In order to get to the next level (whether that’s fixing your vocal break or hitting high notes without falsetto) the best way you can improve your voice is by doing some of these weird warm ups. By the way, if you want a vocal program that will take you through these singing techniques and a ton more, you can check out my complete singing course, Master Your Voice. Singing without doing a warm up is like running a race without stretching beforehand. You may physically be able to do it, but you know your performance would be better if you’d warmed up. With singing, a vocal warm up can improve your performance dramatically. Today, we’ll talk about what a warm up does for your voice and then give you 10 of the best singing exercises for your voice. Just like a sport, singing involves a lot of physical activity. But rather than working your leg or arm muscles, the muscles you’re working are the ones that control the vocal folds. For example, in order to hit an A4, the vocal folds must open and close 440 times per second. That means that for Sam Smith to hit the note “Stay” in “Stay with Me”, his vocal folds are opening and closing 440 times per second! Sopranos and other high voice types often sing notes that vibrate over 1,000 times a second. So a vocal warm up is key for your voice to keep up with this level of activity. A warm up will increase blood flow to the vocal folds and muscles that control your voice. It will also thin out any mucus secretions that you may have on your vocal folds. Most importantly, a vocal warm up will make it easier to sing with a Mix of Chest Voice and Head Voice. If those terms sound new to you, don’t worry. Check out this article on the best singing techniques to improve your voice. All good vocal techniques are designed to help you sing from the bottom to the top of your voice without straining or breaking. The best way to do that is to learn to sing with a mix of chest voice and head voice across your whole range. The blend of chest voice and head voice is called singing with a Mix. And that means being able to hit high notes without falsetto! Learning to sing with a mix of chest voice and head voice takes time and practice. But all the warm ups I’ll show you today will make it easier to sing with a mix. Now before we get into those exercises, there are a few secrets to a successful warm up that everyone should know. Like with anything, there’s a right way and a wrong way to warm up your voice. And while your vocal warm up should be tailored to your voice, there are a few tricks for vocal warm ups that tend to work for everyone. A good vocal warm up should take about 30 minutes. Any more than that and you’re probably tiring out your voice. And remember, the point of singing is to perform songs, not exercises. So don’t gas yourself on vocal warm ups when the whole point is to sing songs. 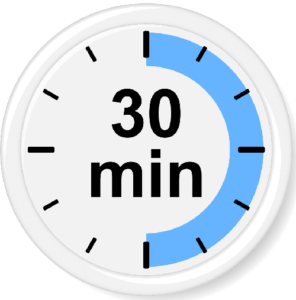 30 minutes is about the minimum amount of time you’ll need to properly warm up your voice. So don’t short yourself on warm up time if you’re going on stage tonight. Budget enough time to get a full 30 minute warm up in. In my 60-minute voice lessons, we usually do warm ups for the first 30 minutes. Then, for the second half of class, we sing a song. I’ve found that this formula tends to work well because at the end of 30 minutes, the voice is pretty warm. And then we’re ready to sing songs you love! Try the same thing with you voice. Secret #2: Focus on the Exercises. Whether you’re learning to sing vibrato, or expand vocal range, learning to sing requires focus. Vocal warm ups are no different. All the exercises we’ll discuss today are designed to achieve a specific skill with your voice. So do your warm ups in a place where you can focus on singing well. I promise this secret makes a HUGE difference! Often, students will start off by practicing vocal exercises in their car. But how much can you focus on singing when you’re driving on the freeway? Instead, practice in a private space at home where you’re free of distractions. And as you do the exercises, try to focus on the feeling the exercise is giving you. Odds are, by focusing on the feeling of the exercise, you’ll see an immediate improvement in your singing. As you start to sing more regularly, you’ll probably need to up your water intake. You may even notice that you have a vocal crack if you’re not well hydrated. That’s because the vocal folds require lubrication to get a healthy vibration. This strong vibration is responsible for the power in your voice. Sometimes, mucus from allergies or acid reflux can get in the way of this healthy vibration. In addition to keeping you hydrated, drinking water also keeps the vocal folds clean and free of mucus. So keep your vocal folds clean by keeping a water bottle handy while you warm up. You’ll be amazed at how much better you can sing. There’s no substitute for good sleep before a big performance. Even if you’re having a singing lesson, adequate sleep plays a big part in how well your voice functions. That’s because even though singing is an important part of your life, evolution does not place singing high on the list of priorities. So if you’re low on sleep, your brain automatically dedicates more focus and energy to more important functions. In addition to losing focus, a lack of rest can also contribute to vocal fatigue. And if your voice is tired, you’re more likely to push your voice to hit the same notes you normally can. You’re tired so you push your voice. But then your voice becomes even more fatigued because you’re pushing it. If you’re going to be singing, it’s best to get a full 8 hours of sleep the night before. You’ll be amazed at how much better your voice sounds! If you have a medical issue with your voice, a singing warm up won’t be as effective as when you’re healthy. So if you have reflux, nodules or just a sore throat, obviously singing isn’t much fun. Depending on the severity of the medical problem, it may be best to see an Ear, Nose and Throat Doctor (a.k.a. “ENT”) first. The Doctor will give you a treatment plan to fix your medical issue. And some voice Doctors will actually recommend that you see a certified voice teacher as part of your treatment plan. If you have vocal nodules, for example, an ENT may recommend you rest your voice in order to help the vocal folds recover. Then he may encourage you to see a voice teacher to fix some of the most common vocal problems. Or if you have a lot of mucus on your cords from allergies or acid reflux, the doctor may recommend you avoid these foods if you’re going to sing. Whatever the case, you can’t expect to sing your best if you have a medical issue. It’s best to wait till your voice is stable. Then the sky’s the limit. Finding the right posture is one of the easiest ways of improving your voice. By maintaining the correct posture while you warm up, you’ll sing with less tension and more power. So if you find yourself slouching or leaning over while you sing, it’s time to correct your posture. The best posture for singing is known as a Tall Posture. The good news is it’s really simple. 1. Stand up and spread your feet so that they’re evenly spaced on the ground and in line with your shoulders. 2. You’ll find that your hips are even above your feet. 3. Your chest should be comfortably lifted. 4. Your neck should also be resting gently above your shoulders. 5. As you sing, keep your gaze forwards rather than towards the ceiling or the ground. 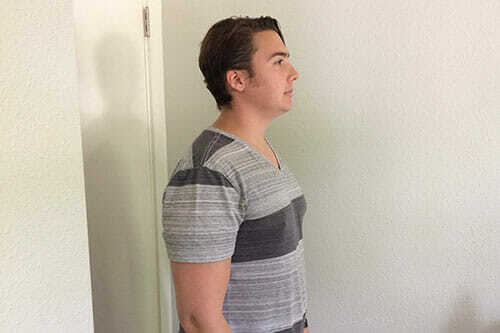 To make sure you’re doing it right, practice the tall posture in front of the mirror. If you’re doing it correctly, you should be able to imagine two straight lines from your shoulders to your feet. This is actually one of the simplest things you can do to improve your singing voice. A low belly breath is one of the best secrets to a good vocal warm up. By taking a diaphragmatic breath, you’re supplying your voice with the fuel to sing powerfully. The good news is that learning to sing from the diaphragm is really easy to do. 1. Place your hand on your belly and take a slow, silent inhale through your mouth. 2. 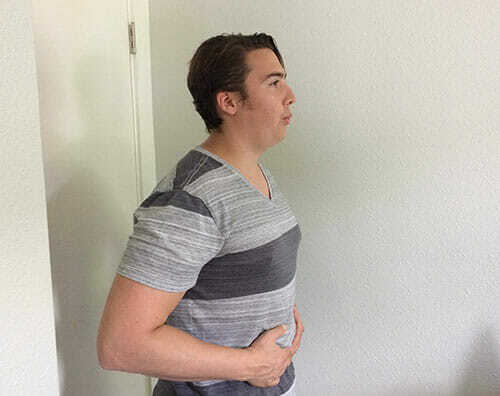 With your hand on your belly, allow your inhale to expand your stomach outward. 3. Then when you’re ready, exhale and allow your stomach to come in or retract. *Practice this breath in front of a mirror to make sure that the top half of your body is totally still. The diaphragmatic breath may seem difficult at first. That’s because many singers have been taught to pull their stomach in when they inhale. But pulling your stomach in actually reduces the volume of air that you can inhale. Instead, allow your belly to expand as you inhale and you’ll be amazed at how much power you have in your voice. Many singers clench their jaw as they sing. This jaw tension may be the result of a habit or a more serious joint disorder such as temporomandibular joint disorder (a.k.a. “TMJ”). In either case, learning to release tension in the jaw can make a huge difference to your singing. While it’s true that narrow vowels can help you sing some notes better, we always want the freedom to move our jaw without tension. Try to practice in front of a mirror and monitor the openness of your mouth as you sing. This can make you aware of your any jaw clenching. If you notice any tension, try to consciously open your jaw as you sing. A good guide for the correct position of your mouth is to say the word first. As you speak the word, monitor the position of your jaw. Then, keep the same openness in your mouth as you sing the word. Keeping your singing at this “speech-level” can make a huge impact on your voice. If your believe your jaw tension is caused by TMJ, seek the help of a medical professional to treat the condition. The doctor may recommend some light massage or medication to relax the join pain associated with TMJ. As you learn to relax the jaw you may notice that your voice sounds more powerful and free. And vocal freedom is something every singer needs! Now that you know some of the best kept secrets for warming up your voice, it’s time to get into get your voice ready for the show! We’ll begin with the simplest warm ups, then move on to the more difficult ones. So if you have any trouble singing the following exercises, go back to an exercise that worked for you. Then when you’ve gotten that one perfect, move on to the warm up that’s more challenging for you. The first step in getting your voice warmed up is getting you connected to your chest voice. If you haven’t heard the term chest voice before, don’t worry. I’ve written an article on 10 Singing Techniques to Improve Your Voice that explains chest voice in more detail. Why does all this chest voice stuff matter? Well, many vocalists sing breathy and light at the bottom of their voice. And if your voice is light and breathy on bottom, you don’t have a chance of singing high notes with power. That’s because the chest voice is the foundation for all the notes that come above it. So it pays to start here. Take the power of your speaking voice and apply it to your singing voice. This may sound like a strange solution but follow me for a minute. Many people who have a strong speaking voice sing too lightly. So if you applied the same strength of your speaking voice to your singing you would end up with a strong foundation for your higher notes. So the first exercise we’ll use to strengthen our voice is the 5-Tone Count. 1. Begin by saying the number “One” aloud at a comfortable volume. 2. Find a comfortable starting pitch (try C3 for guys and G3 for girls) and say the word “One” on that pitch. 3. Next, say the numbers 1 through 5 on pitch with the ascending 5-Tone scale pictured here. I’ve created a video showing you exactly how to do this exercise. Remember that the whole point of the 5-Tone Count is to match the strength of your speaking voice and your singing voice. So if you hear any breathiness or lightness in your tone, you’re doing it wrong. The goal of this exercise is to speak/sing these notes. This exercise may sound ugly to you. But we’re not doing it to sound pretty. We’re trying to get the full power of your chest voice on the notes. Stay at a consistently strong volume. The lip trill is one of the safest and most powerful vocal warm ups. In this we’re going to let our lips flop together in order to create a safe way to sing to the top of our range. The lip trill is almost like a compressor for your voice. For those of you who tend to sing really loud and strainy at the top of your voice, the lip trill will help you hit high notes without straining. Or for those that tend to sing a little breathy or back off at the top of their voice, the lip trill will help the vocal folds stay together throughout your whole range. That means hitting high notes with a mix of the chest voice and head voice. 1. Blow some air between your lips to make them flop together. This should be done in a very relaxed way. Make sure you’re not holding your lips tightly in order to get the lips to bubble. Just relax let them gently vibrate together. 2. Now while your lips are flopping together, add a bit of voice like you’re saying the word “Uh” behind the lips. It will probably make a bubbly sound like you’re under water. 3. Find a comfortable starting pitch (try C3 for guys and G3 for girls) and allow the lips to flop together while you sing the on that pitch. Now if you’re having a hard time getting the lips to flop together or don’t have a piano handy, don’t worry. I made a video demonstrating the exercise with all the male and female keys. Remember the lip trill is designed to keep an even sound across your whole range. Make sure that your volume stays consistent when singing from bottom to top. Try to keep your lips flopping evenly. Remember that you’re trying to sing the “Uh” vowel as you do the scale. So your tongue should remain flat and in the front of your mouth. Now that we’ve sung up to the top of your range without disconnecting to falsetto or straining, let’s sing across your range with a slightly more open mouth. While the lip trill is my absolute favorite warm up exercise, it doesn’t work for everyone. That’s because some people need a little more vibration in the vocal folds in order to get a strong mix of the chest and head voice. If you noticed that you “flipped” or had a vocal break, don’t worry. We can fix your vocal break easily with the Octave and a Half Squeaky Door Exercise. 1. Pretend you just had a delicious meal and make a humming sound on the consonant “mm”. Go ahead and make it really enthusiastic “mm, mm, mmmmm”. *Note that your mouth should be closed and the humming should be coming through your nasal passage. 2. Now, take that “mm” sound and hum up to a higher note keeping the “mm” really squeaky like a creaky door. 3. Use the squeaky “mm” sound and sing it on a comfortable starting pitch (try C3 for guys and G3 for girls). Sure, the lip trill can be great for singing high notes without falsetto or strain, but it doesn’t sound like real singing. So what do we do to get ready to sing songs? Let’s work on the Octave and a Half “Gee”. With this exercise, the “ee” vowel lets the vocal folds stretch, which helps us find our head voice. If you haven’t heard the term Head Voice before, don’t worry. I’ve written an article with 10 Singing Techniques to Improve Your Voice which explains it more. Back in the old days, singers found that notes at the top of their range resonated in their head. Finding your head voice is the key ingredient in helping you sing higher. But rather than just singing in falsetto, the “Gee” exercise helps us sing with a mix. That’s because the “G” consonant brings the vocal folds together. Put them together and you’ve got a recipe for hitting all sorts of notes in your range without falsetto. 1. Say the word “Gee” as in “Geese” at a comfortable volume. 3. Now find a good starting pitch (try C3 for guys and G3 for girls) and begin to sing the word “Gee” on that pitch. Again, if you don’t have a piano handy, I made a video demonstrating the exercise with the appropriate male and female keys. Now that we’ve gotten your entire range warmed up on the “Gee” exercise, it’s time to isolate a few of those trouble notes in your bridge or passage. If you haven’t heard the term bridge before, don’t worry. I’ve written an article on 10 Singing Techniques to Improve Your Voice that explains the bridge in more detail. The “bridge” or “passagio” is the area where the voice transitions from the chest voice to the head voice. Some singers can make this area sound perfect. But most singer’s voices will have a vocal crack or strain in this area. Learning to connect the vocal registers is one of the 40 proven singing techniques to help you sound better. So let’s take a look at those notes specifically. One of the best ways of warming up your voice is hitting those notes on a “Bee” exercise. 1. Say the word “Bee” out like like you’re talking about the insect. 2. Now sing the word “Bee” on a comfortable starting pitch (try E3 for guys and C#4 for girls). Note that the whole point of this exercise is to help you hit those notes in your bridge without falsetto. So if you notice that you’re flipping on the top note of the scale, try to emphasize the “B” consonant. Since the “B” is a voiced consonant, you’re more likely to be able to hit that top note with power. The bratty “Nay” is probably the most well known Speech Level Singing exercise. And #2, it really works! Now while the Bratty “Nay” is a pretty ugly exercise, it can be a great vocal warm up to help you sing with a mix. The bratty sound that we use for this exercise keeps the vocal folds closing more efficiently. And the “ay” vowel helps point us toward our head voice. You can hit amazingly high notes without falsetto! 1. Say the word “Nay” (as in “Neighbor”) in a bratty way. The sound should be buzzy and nasal-sounding. 2. Now sing a comfortable starting pitch (try E3 for guys and C#4 for girls). If you have any trouble, check out this video where I demonstrate the exercise. Remember that the whole point of this exercise is the “bratty” tone. As a matter of fact, if you sing this exercise too normal-sounding, you may actually strain. So keep it really ugly. Additionally, focus more on getting the ugly sound than having a strong volume. That bratty sound isn’t only good for those notes in the middle of your voice. Done correctly, the ugly, bratty sound can help you hit some amazing high notes with power. The only problem is that since “Nay” is a somewhat narrow vowel, your voice may tend to squeeze a bit once you get into your highest notes. Instead, let’s sing across your whole range with an ugly “Nae” (as in “Nasty”) exercise. 1. Say the word “Nae” (as in “Nasty”) out loud in an ugly, bratty way. If you need inspiration, just remember how kids tease each other on the playground “Nae Nae Nae-Nae Nae”. 2. Now sing the bratty “Nae” on a comfortable starting pitch (try C3 for guys and G3 for girls). Since the “Ae” (as in “Apple”) vowel is so wide, it tends to make people try to yell. But yelling defeats the whole purpose of this exercise since that would be straining. Sure, the bratty “Nay” is great for helping you sing with a mix, but it’ll only take you so far. Obviously, nobody wants to hear you sing “All of Me” with a bratty tone. So let’s do a vocal warm up to get a more performance-ready tone. The Octave Repeat No gives us all the good stuff of the bratty “Nay” without the funny sound. The “N” consonant helps the vocal folds close just like the “Nay”. But the “Oh” vowel allows the larynx to relax slightly, normalizing the tone. And that creates a sound that’s much closer to real singing. 1. Say the word “No” (as in the word “Note”) out loud at a comfortable volume. 2. Find a comfortable starting pitch (try E3 for guys and C#4 for girls) and sing the “No” on this pitch. As always, if you don’t have a piano handy, no worries. I’ve created a video demonstrating the exercise in the correct male and female keys. The “No” exercise can be a lot harder than the bratty “Nay”. That bratty sound helps out a lot. But the “No” exercise is definitely worth perfecting. As you sing toward the top of the scale, it may be tempting to “spread” the vowel towards an “Uh” or “Ah” vowel. Don’t make this mistake. Practice in front of a mirror to make sure you’re singing the right vowel. Now that we’ve started singing some high notes with a more normal sound, let’s challenge the voice even more. Now that you’ve started to hit those higher notes with a more normal tone, it’s important to keep that tone normal. However, usually when we start singing higher, we start to raise our larynx or voice box in order to keep the top notes strong. Singing with your larynx in a neutral position is another of the 40 proven singing techniques. One of the best ways of hitting high notes with a relaxed larynx is using a “crying” sound. 1. Pretend that you’re a sad little kid and say the words “Go Go Go” like you’re crying or sobbing. 2. Using the crying sound, sing the word “Go” on a comfortable starting pitch (try C3 for guys and G3 for girls). Keep in mind that the whole point of this exercise is to relax the larynx. But it can be really easy to start to spread and yell the “Go” exercise as you sing higher. So rather than focusing on raising the volume as you sing higher, try to use the “cry” sound to get those top notes. The Octave and a Half “Mum” is another famous Speech Level Singing exercise. That’s because it tends to help a singer “finish” their vocal warm up. Up until now, we’ve been working with warm ups that give you a lot of support in singing higher notes. But the “Mum” can potentially screw you up. That’s because “Mum” exercise is the closest warm up to real singing. So if you’re doing pretty well on the previous exercises, make sure to practice the “Mum” exercise before you start singing songs. 1. Saying the word “Mum” (as in “Mummy”) aloud at a comfortable volume. If you can’t read music or don’t have a piano handy, don’t worry. I’ve made a video demonstrating the exercise in the right male and female keys. The “Mum” exercise may be the most challenging vocal warm up for you. If this warm up is too difficult, just go back to an exercise that’s working well for you and stick with that until you feel ready to try again. Similar to the “No” exercise, it can be tempting to spread the “Uh” vowel in the “Mum” exercise towards “Ah”. Don’t let it. Practice in front of a mirror to monitor your mouth position. How to Warm Up in a Hurry — No Instrument Required! So far all the exercises that I’ve shown you require you to sing a scale or be close to a piano. But what if you’re already at the gig and need to warm up in a hurry? Here’s an exercise that will help you warm up your voice without needing an instrument. 1. Say an “Mm-hmm” like you’re agreeing with someone at a comfortable volume. 2. Say the “Mm-hmm” more slowly and hold the second pitch in the sound (the “hmm” part). This pitch is lower than the first one. 3. While you’re holding the second note in the “Mm-hmm” try to isolate a single pitch. 4. Now sing the following scale on a lip trill with the pitch you just found. As always, if you can’t read music or sight-sing this scale, no worries. Check out this video where I demonstrate how to do this vocal warm up without an instrument. If you’ve been following along with the exercises, this warm up should take about 30 minutes to complete. That’s the perfect amount of time to warm up before you sing. Of course, sleep, hydration, rest, and having a healthy voice can make a huge difference in how well your voice warms up. So make sure that all of those are in place before you attempt these exercises. Singing well is a long journey, but it’s worth it. And a vocal warm up is the best place to start. If you’re looking for a warm up that’s custom tailored for you voice, you can Book a Free In-Person Lesson here. Thank you so much for all of this information! 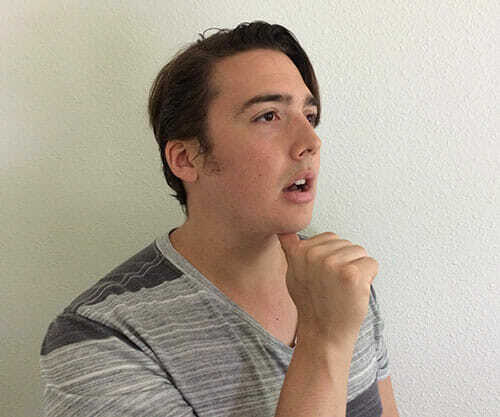 I also struggled with feeling “SillY” and self-conscious when i first started voice lessons. it can be very odd and vulnerable to do these in front of just one person. lol. your explanations help illustrate the value of these kinds of exercises in order to truly improve. thank you for also reminding me about hydration, breath and posture. Man you’ve given all these secret exercises that really unlock the voice very effective all for free. Thanks for your wisdom my friend. You’re crazy this is really a $360 secret. Thanks so much for your message Nithin! I’m so glad these exercises were helpful for you. Hello Matt, thank you for « generoursly » sharing your excellent warm up exercices. I’ve already see impacts on my voice. I’m interested in opera and choral songs. Do you have specific suggestions to warm up tenor voice. Do you have exemple of tenor who become excellent opera signer by using your warm up? Hey Mike, thanks for your comment. I’d recommend practicing the Vocal Warm Up Videos #1 and #2 in order. There are lots of great scales for you to practice along with there. Pavarotti used similar warm ups, but most of my students sing contemporary pop styles. That doesn’t mean it won’t help you. It’s just a bit different in terms of the sound you’re looking for. Hope this helps!